August is here - we are 8 months into the year.... where has time gone?! Cray cray! I'm off on holiday next month, I can't believe how fast it has come around! 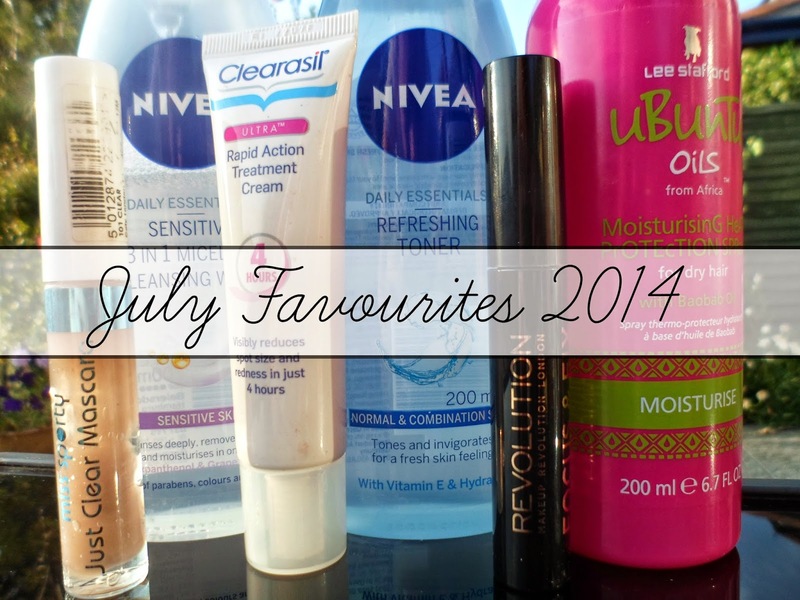 With a new month beginning, the blogging world knows what this means - monthly favourites time! Here's the stuff I have been loving in July! First up - the Focus & Fix Original Eye Primer from Make-Up Revolution. After apparently loosing all of my other eyeshadow primers recently (seriously I have no idea where they've all gone?! ), this has majorly come to my rescue. You may remember me talking about it in my MUR haul a few weeks back! This is great and I have used it everytime I've rocked eyeshadow in July and it has worked a charm! A total bargain too! The Miss. Sporty Just Clear Mascara is one of those products I picked up randomly when browsing through Superdrug - I'd been looking for a cheap clear mascara for ages ... and not for my eyelashes! I use this on my eyebrows to keep them neat and in place throughout the day (hence the dodgey colour!)! Works like a charm and under £2! Next a couple of products from Nivea. I seriously love Nivea and the Sensitive 3 in 1 Micellar Cleansing Water and the Refreshing Toner have made their way into my daily skincare routine over the last 4 weeks. I've been using this after I've removed my make-up at night (not too remove my make-up... I need something slightly stronger for that mission) and after my shower in the morning! It leaves my skin feeling cleanse and fresh and ready for the day - or bedtime!! I also got these while they were on offer so total bargains too! Onto a hair product now - I have been obsessed with this whole range since it entered my life (read all about it here) and this product has made it's way too firm favourite... I think - it's a tough call! This is the Lee Stafford Moisturising Heat Protection Spray from the new Ubuntu Oils range. This stuff smells amazing - I love that you can keep the smell of the shampoo and conditioner fresh by layering it with this stuff! Works great before drying and styling - love love love. This month I have been plagued by a horrendous outbreak and one in particular huge giant unfriendly spot. Like literally needed it's own postcode. Not cool, seriously not cool. This stuff though seemed to help me a tiny bit it's Clearasil's Ultra Rapid Action Treatment Cream. This is the stuff I always reach for when I have an unwanted pal arrive on my face - in fact I've probably mentioned it before on here! It reduces redness and size in just 4 hours and really has helped - total lifesaver. Last up is a non-beauty related product! I recently watched Vampire Academy after rented it from the Playstation store. I had seen this advertised and in my opinion it looked awesome! I love Zoey Deutch, after watching her in Ringer & Beautiful Creatures I decided she is awesome and I must watch everything she's in haha! Because I loved the movie (I don't know how it got such bad reviews!) I decided to start reading the books - as far as I know there's 6 in he series and I got the first 3 on my kindle for just £6.99 - woopwoop! Totally loving them so far! Just watched vampire academy after reading this post. That movie is absolutely perfect, it had the perfect mix of action, romance and comedy plus vampires, thanks so much for the recommendation, I might have to read the books now! really nice favourite post :) love the nivea cleansing water and toner! I need to try the makeup revolution eye primer! Have you tried The Hunger Games yet? I really like the clear mascara by Miss Sporty, though mine looks the same, a bit dirty! Oooh I may have to try the Nivea Micellar Water & Toner, sounds like something really budget friendly!